We’re the international content discovery team, our 6-week mission, to boldly go where some people have gone before, finding international users’ needs. 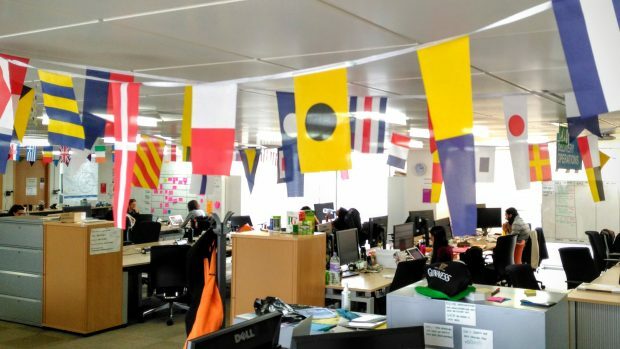 Camped out on the seventh floor at Aviation House, with vaguely international-themed bunting, we have spent the last few weeks digging into existing research on GOV.UK’s international users and auditing all international content. While on our travels, we’ve discovered there are a few gaps in our understanding around these things. So we’re going to attempt to fill those gaps with some of own user research involving British people living abroad and non-British people living in the UK. Having a fuller picture will be particularly useful once our research starts to focus, in part, on how needs of international citizens might have changed as a result of the EU referendum. We’ll also be working closely with international facing departments to see how or if their priorities have shifted. We’ll set up potential ways for us to work together to meet international user needs as Brexit unfolds. At the end of the 6 weeks we’ll pull our findings together into a strategy report that will be used to inform next year’s GOV.UK roadmap as well as, hopefully, being a resource for GOV.UK teams and departments working with international users. Watch this space, we’ll have more blog posts to follow. Do you plan to share the content audit with everybody via Basecamp or similar - so we can help to make sure you found all the relevant pieces of the puzzle? Sounds like a great project. I'd love to participate as a non-British living in the UK.